Win £10,000 for your department! Be creative! Vlogs, podcasts, presentations, videos, posters... you choose how you submit! Win a MacBook air and many more prizes! Who will win...? You don't have to be a Finance whiz! Why is CGC partnering with F&C Investment Trust? CGC is delighted to be working with F&C Investment Trust in helping to improve financial education. F&C IT is the world's oldest collective investment fund, established in 1868, with a passion to improve financial knowledge within the community, to make sure that as we move through our lives we understand our financial goals and how to achieve them. For those of who don't study finance, an investment trust is a vehicle that invests everyday people's money in stocks and shares. F&C IT was the first of its kind – the first vehicle that allowed ordinary people to "pool" their assets, thus giving them access to the stock exchange, which was previously the preserve of the wealthy. The Board are keen to combine their collective knowledge with our students' innovation and entrepreneurialism to help in improving the public's knowledge about the need to secure their financial future. We believe this is a fantastic opportunity, not only for our students to join forces with one of the largest brands in financial services, but also for the winners to develop their own career goals. Not only will this competition offer some amazing cash and Apple prizes, but also give winners the chance to network with the F&C Board and attend a mock interview day with the HR team who interview globally on a daily basis. The F&C Investment Trust Prize is asking CGC students of any faculty, to creatively answer one of three questions. We must iterate that the level of understanding is not what will be judged, but the creativity, explanation and thinking which would be understandable to a regular investor like you. We have three categories to choose from. Entries will be shortlisted by our review panel. Shortlisted submissions will be posted online for a public vote, so your friends and family can show their support and the judges will take into account the public vote when making their final decision. Our judging panel for the final vote comprises national journalists, senior members of the College and Board members from F&C Investment Trust. "Investing" is not a particularly hot topic with young people, but with changing state aid and the unknown future, how do we better prepare people to start thinking about financial security from a young age? Why do we need to invest and when should we start thinking about it? In a nutshell, why does investing matter? Financial futures: how do we prepare ourselves? In the past, generations have benefited from housing market growth to secure their nest egg. With the "property ladder" being an increasingly difficult challenge, how does this affect young people's ability to prepare for their future? 150 years ago, F&CIT invested in the Amazon, now it's amazon.com... what can we expect in 150 years' time? If you could only buy one thing now to invest for your future, what would it be? Shortlisted entries will be announced in February, ready for voting by the public, so encourage your friends, families and ambassadors to join in! Finalists will be in with the chance to win a new iPad, and the winning entry will win a heap of prizes! You can enter in teams or as an individual, all entrants must have a valid student ID. To register your entry, please go compete the form above, and enter your details for the next steps. 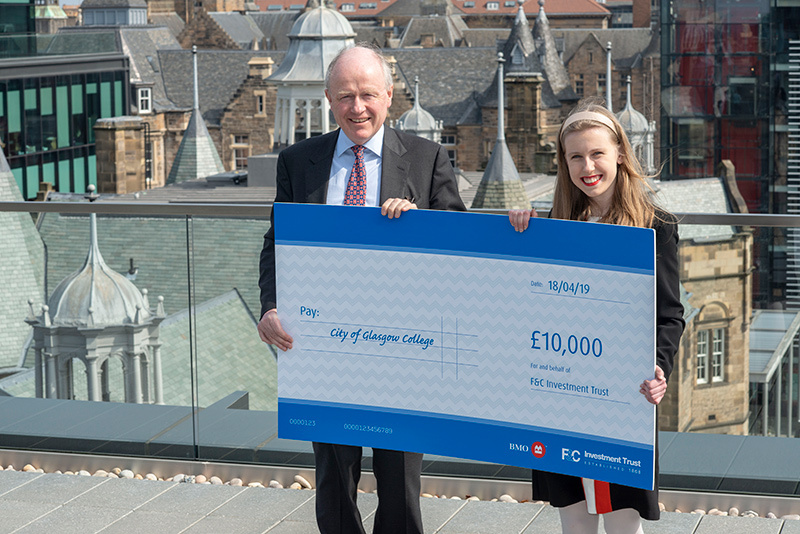 The F&C Investment Trust Prize is a first of its kind competition for the City of Glasgow College! We are working with a global, award-winning financial services firm (BMO) to bring our students access to a host of prizes and the prestige of this annual award. The competition aims to bring financial awareness to our students, so that you are informed when planning your financial futures. You don't need to be studying any finance related courses, it truly is open to anyone, and any interpretation of your answer to any of the three competition questions! Any of our current students can enter the competition here. Yes, you can! All entries will go to an expert panel who are looking for the most creative answers to our questions. The competition is not judged on financial knowledge or hours of studying a finance course, but it is judged on simplicity, creativity and understanding of the key themes. There are lots of brilliant prizes for our entrants! Will it help me in my career development? Yes, the competition has some great prizes from MacBook air, iPads, £10,000 for CGC departments as well as a meeting with the F&C Investment Trust Board members AND a simulation interview with feedback from the HR department, invaluable for your future career planning! The F&C Investment Trust Prize is asking CGC students of any faculty, to creatively answer one of three questions. We must iterate that the level of understanding is not what will be judged, but the creativity, explanation and thinking which would be understandable to a regular investor like you. We have three categories to choose from, each category will be shortlisted by a prestigious panel to reveal the finalists. The final submissions will be posted online, to be chosen by the voting public! Investing: why and when? 'Investing' is not a particularly hot topic with young people, but with changing state aid and the unknown future, how do we better prepare people to start thinking about financial security from a young age? Why do we need to invest and when should we start thinking about it? Financial futures: how do we prepare ourselves? In the past, generations have benefited from housing market growth and defined benefit pension schemes to create financially secure futures. But without knowing if we will receive thematic booms, or be able to lean on state aid, how do we prepare ourselves for financial independence in retirement and beyond? Growth: 150 years ago, the F&CIT invested in the Amazon, now it's amazon.com…what can we expect in 150 years' time? If you could only buy one thing now to invest for your future, what would it be? What will be the next Amazon and how should they be applied for a diversified financial portfolio? Individual or groups (up to 8 individuals in a group) • Anyone with a City of Glasgow College Student ID • Submitted in any creative medium from vlog to essay, video to podcast • Should take no longer than 5 minutes to read/watch/listen to/consume. Click here to register your entry place! I have a specific question, who can I ask? We will be manning an inbox for questions via email help@F&Cinvestmenttrustprize.co.uk. You can also email any questions you have through to fcit@mipagency.com. Are there maximum group sizes for entries? Ideally, groups should be no more than 6-8, but let us know if you have a reason for requesting a larger group. We will always try to be flexible. The main prize is £10,000, to be awarded to your faculty. A Macbook Air will be awarded to the individual winner, however if the winner is a group, this will be a shared prize to the equivalent value. There are also lots of "soft" benefits on offer: including a trip to London to meet the F&C IT team, careers counselling / interview tips and help with your CV. And of course, you will have made some great contacts in financial services!! © 2018 BMO Global Asset Management. All rights reserved. Information in this section of the website is directed solely at persons who are located in the UK and can be categorised as retail clients. Nothing on this website is, or is intended to be, an offer, advice, or an invitation to buy or sell any investments. Please read our full terms and conditions and the relevant Key Information Documents (“KID”) before proceeding further with any investment product referred to on this website. This website is not suitable for everyone, and if you are at all unsure whether an investment product referenced on this website will meet your individual needs, please seek advice before proceeding further with such product. The value of your investments and any income from them can go down as well as up and you may not get back the original amount invested. Past performance is not a guide to future performance. Thank you for submitting your entry. You should receive an email confirmation shortly.